U.S. markets are staging a long-awaited rebound this week, bouncing higher for a third straight session Wednesday after a particularly nasty short Thanksgiving trading week. That might pull investors' attention back away from conventionally defensive assets like gold. But that's a big mistake. After a prolonged stretch of underperformance, gold is finally staging a major turnaround here. Simply put, gold has moved from laggard to leader territory from a price standpoint. And now looks like as good a time as any to build a position in the metal. To figure out exactly how to trade it, we're turning to the charts for a technical look. Leading things off is the popular VanEck Vetors Gold Miners ETF (GDX - Get Report) , an exchange-traded fund that holds 49 different publicly traded gold mining stocks. GDX is popular because it's a one-stop shop for exposure to gold-mining companies. Shares broke higher in a classic reversal setup back at the beginning of October, and since then, they've been managing to make a series of long-term higher lows that defines an uptrend. 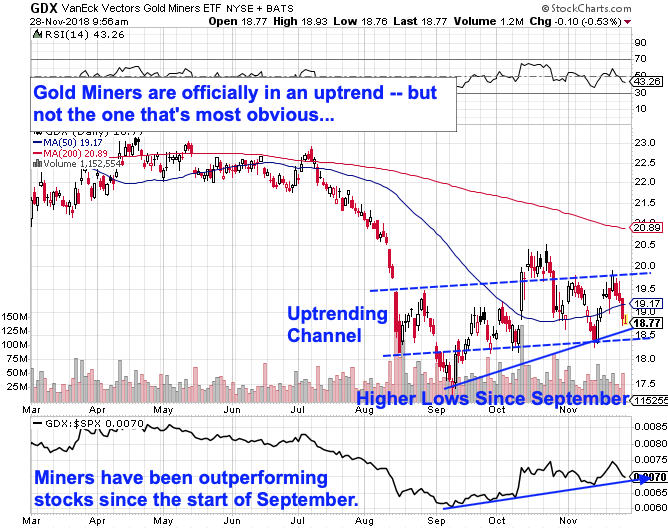 Most gold-watchers will likely consider the important trendline in GDX to start at this ETF's September lows. Instead, I think a more important trendline starts at the swing low in August that precedes that September reversal (the dashed line on the chart). That trend is less aggressive, and it's also a common way to define a trend during periods of high sentiment swings. Meanwhile, relative strength continues to show that GDX is still outperforming the S&P 500 here. A near-term dip to trendline support in GDX looks like a solid buying opportunity with well-defined risk. Barrick has been rallying extremely hard in the face of stock market volatility, most recently consolidating just below the key resistance level at $13.50 set earlier this year. 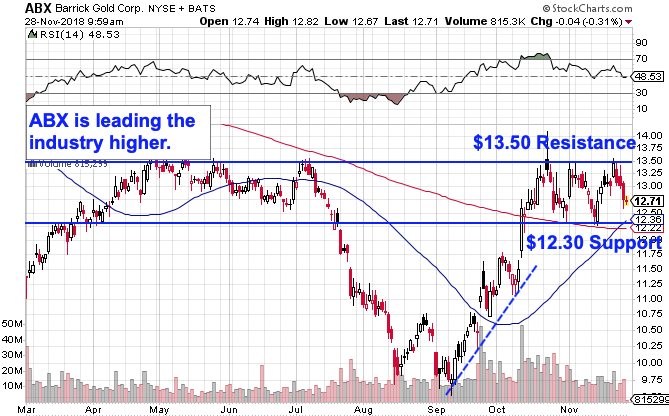 Simply put, a breakout through $13.50 is a signal that Barrick is opening up more upside potential in the short-term. However you choose to play it - through GDX or ABX - gold's status as a hedge in volatile markets makes it worth keeping an eye on here, even as the broad market manages to push higher in the final stretch of November.